Have you heard of or maybe have you experienced it when you were younger, that your parents told you to pursue being a doctor when you grow up? This is precisely the reason why. Doctors and surgeons are on the top of the list of highest paying jobs. Going into medical school and pursuing this type of career is no joke. It definitely requires patience and perseverance to finish it but once you do, it can yield great results for you. According to MSNBC, annual salary of doctors and surgeons in the US can range from $168,650 up to $234,950, depending on what field they specialize in, anesthesiologists being said to earn the highest. These are the people that you would want to see in case you develop problems with your teeth, gums, or anything that involves your mouth and positioning of your jaws. They are paid highly for a reason and that is because they studied dentistry specifically to understand how the teeth should be positioned and they were trained to correct teeth that are not positioned correctly and they also check how that affects your jaws and they will be also be able to correct that. According to MSNBC, these professionals can earn about $161,750 to $204,670 yearly. Do you understand why there are plenty of movies emphasize on being the CEO of a company? It is because Chief Executive Officers are on the top 3 of the list of best paying jobs in the US. They have the highest position in the company and they are in charge of seeing through the overall operations of the company and they also are the ones who communicate with the company’s board of directors and other companies they do business with as well as having the final say in major decisions for the company. Steve Jobs, Mark Zuckerberg, and Bill Gates are some of the famous CEOs we know did or are still doing well until today. Chief Executive Officers or CEOs can earn as much as $176,550 per year. Some of you may be hearing this for the first time, or probably have heard of it but are not entirely sure what is it they really do. Petroleum engineers concern themselves with activities related to gas and oil and they then explore and design effective methods in which they can extract petroleum products from the earth’s surface. It does sound like a lot, actually, but as of May 2017, according to BLS, there are 32,010 people in the who are practicing petroleum engineering related jobs. This job should really require determination in order to pursue it. And according to MSNBC, petroleum engineers earn about $138,980 annually. 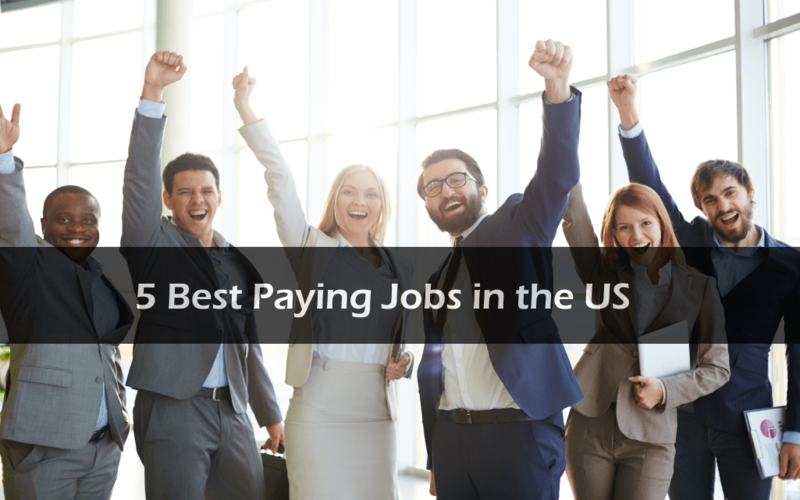 Last but not the least, the 5th best paid in the US would be the lawyers. There are many types of lawyers out there and each one specializes in certain and specific fields, but we would not want to mess with any of them because they all know the law. The highest paying states in the US for lawyers are Columbia, Los Angeles, and New York. But then, these would all depend on how good of a lawyer you are and what kind of law you are practising in a certain state because they do not all make the same because it would also depend on how much clients they are getting. Ted Khalaf, a Los Angeles family law lawyer, said regarding divorce lawyers that “a High Net Worth Divorce attorney is extremely beneficial for wealthy individuals with much to lose from a divorce,” and these attorneys are usually ones with enough experience in their fields and it would make sense for clients to trust them more easily to handle their cases. It would also make sense for corporate lawyers to earn more in New York as there are plenty more opportunities there for them to work for large companies or firms. In the state of California, family law lawyers are highly likely to earn more especially in Los Angeles since the city is known to be home for people seeking for assistance with their marriages and other family concerns. According to MSNBC though, lawyers are generally thought to earn about $130,490 annually. So if you ever need legal and expert advice, then you know who to call.